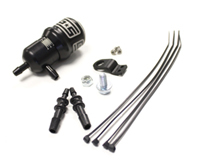 AEM boost control solenoid kits will not degrade rich fuel mixtures like most common boost control solenoids. This will significantly extend life and eliminate the chance of sticking from contamination. This is the replacement Diaphragm for AGP Internal Wastegate Actuators. Introducing the next generation of the Blitz SBC Boost Controller from Japan. These units are more compact than before and still packs the same high performance of the as the controllers before! *New compact controller display is only 12mm thick. GFB puts the key to boost control in YOUR hands! Your EVO utilizes factory boost control, most of which display a tendency to be conservative in allowing the boost to build up, and then taper away noticeably toward redline. Ok so the GFB Turbo Fuse is not technically a boost controller even though it's in the boost controller section. It does however have a very important place as part of a boost control system so read on! GReddy has introduced the next evolution in the GReddy Profec line of electronic boost controllers. The unique compact OLED Display and improved CPU processor improve performance and stability. Those features combined with the new layout improves usability. The Hallman EVOLUTION RX Kit uses the same valve as the Pro RX Kit, and has the same features (INCLUDING A CERAMIC BALL), but ALSO is integrated into a self-contained cockpit controller cable system. The new Hallman Pro Cockpit Controller Add-On Kit contains the cable system that will adapt the Pro and Pro RX Hallman boost controller valves for inside-the-cockpit adjustability. The EBCS Pro Series 3-Port Electronic Boost Control Solenoid is designed to control today's high performance wastgates with it's ultra fast response and bomb proof design. New Improved SafeInjection™- boost/timing reduction system for use with the Boost Cooler® water/methanol injection system promises to revolutionize the industry by providing for safety even with the most aggressive tunes. New SafeInjection™ flow gauge to display water-methanol flow in ml/min in real time. For use with the new #30020 redesigned Safe Injection™ unit.